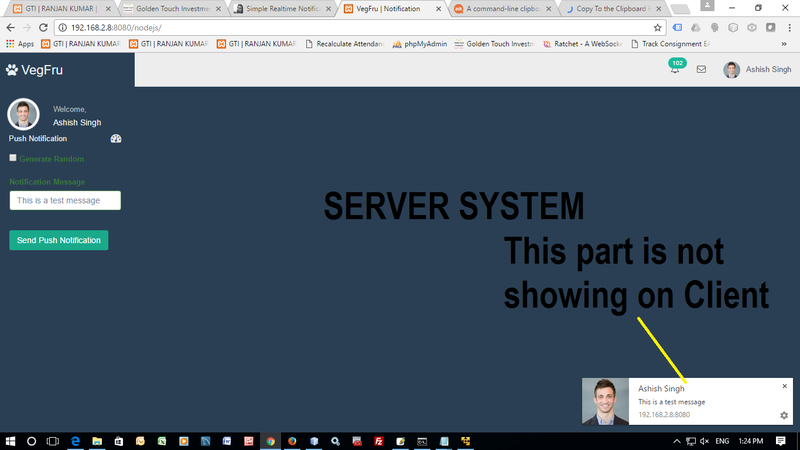 A simple Realtime Notification System using PHP, NodeJS and Socket.io. Download the zip and follow the instructions mentioned in the README.md file. I have downloaded your code and its working fine on server. while on connected clients No Popup is coming when notification inserted to database. Total number of notifications are increasing on all connected clients. On server it display pop notification but not on clients machines. Thank you for writing. I’m not completely understood by “On server it display pop notification but not on clients machines.” would you please elaborate that part ? notification box which comes in animated format is not showing on client systems. did you see any error in the console ? Also this implementation doesn’t support to send Push notification, meaning if the page is open then only you’ll get notification else you wont. Please describe your requirements so that I can help you. I am looking for same solution which you have developed, If same page is opened on many client system. 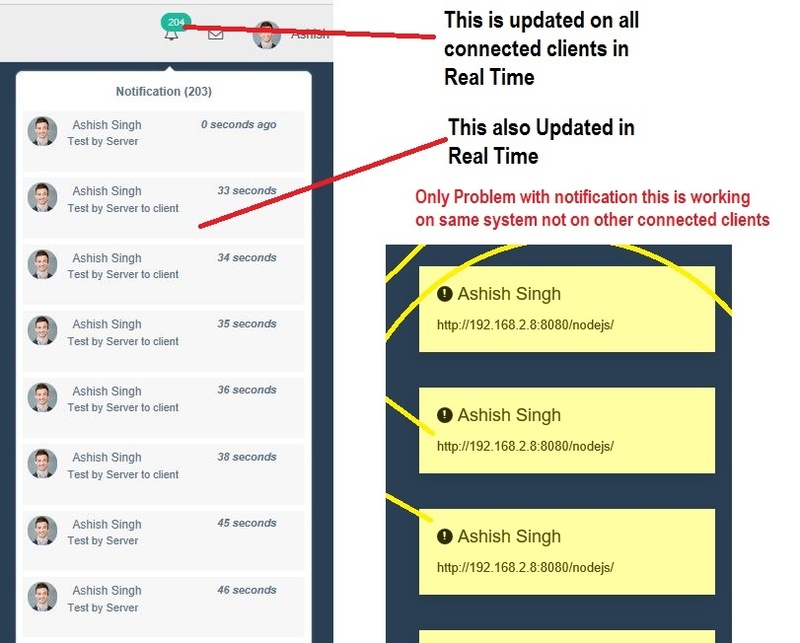 Any one submitted notification, It should be visible to all connected clients and on server also. While Notification count increase in real time and onclick div open is also updated in real time. so basically the notification is now showing to connected client’s system right ? Just clone that repository, run `npm install` `npm run dev or node js/nodeServer.js` and this should work fine. Also do let me know if you’ve run the `nodeServer.js` file on the server. I’ve tested it on my end everything seems to be working fine now. (node:9932) DeprecationWarning: process.EventEmitter is deprecated. Use require(‘events’) instead. which version of socket you’re using ? I have updated the same, Server started. `console.log(data)` and tell me what you’re getting after pushing notification. Give me some time. I’ll verify this again and get back to you asap. Hey @disqus_6EWI7v3p1c:disqus I just verified. It’s not working for me either. I apologize for the issue. I’ll fix this asap and get back to you. Let me know if that works for you ? Thank you for sharing the log Rajan, which seems normal though. I’ll check it out on my end and let you know by EOD. Meanwhile if you able to work around please share or create PR https://github.com/imrealashu/php_node_socket_notification here. On server system it is working perfectly. After submit a message, 3 things happens. 1. Total Number of Notification Updated – Working on Client system also(Real Time). 3. 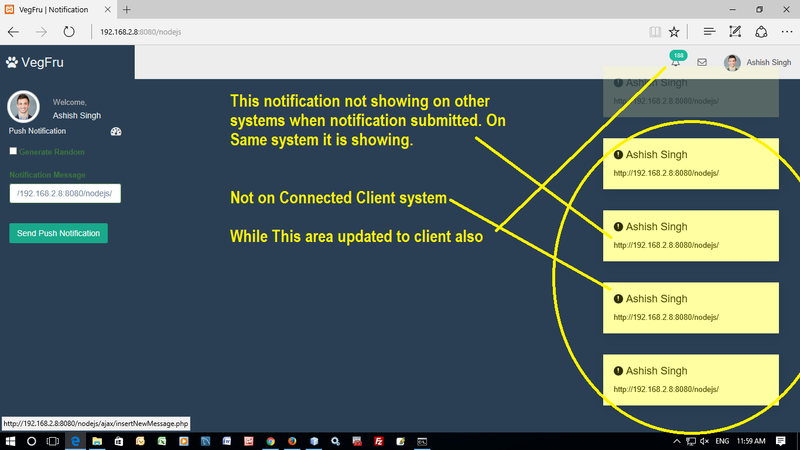 A pop up generated(Notification on windows or on page in yellow color box) – Not Working on Client while it is working on server. The download link is broken!